This time last week I was making preparations to leave town with my oldest daughter for a few days. Included in those preparations were plans for Ty, Bridger's service dog, to be cared for in our absence. The spectacular spreadsheet of details that it takes to care for Bridger and the others when I am out of town is complicated enough without having to include details for dog care. I made arrangements for him to stay in the most wonderful, indulgent place I knew. . . with his former puppy raiser. The organization that provided Ty to us is the créme de la créme of service dog organizations. The finest dogs of temperament and health are bred and re-bred for generations to produce the most refined of the breed. 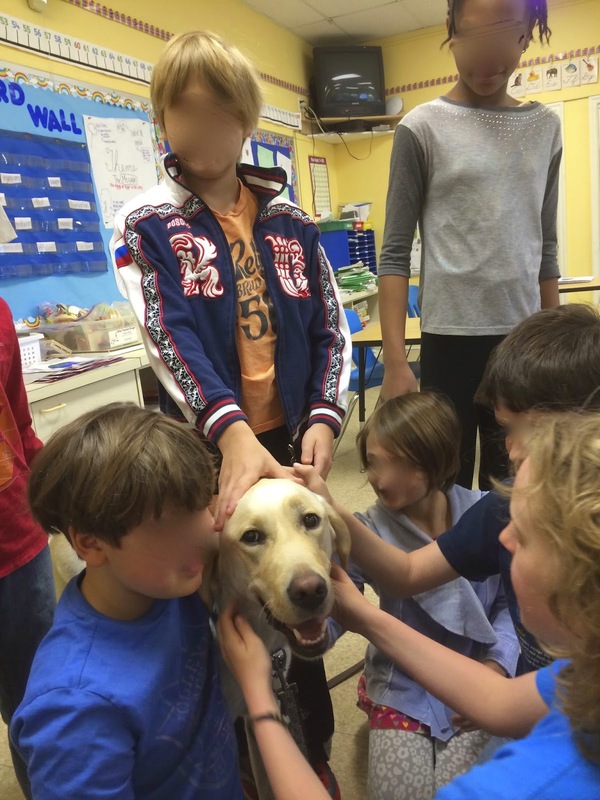 Ty was bred into the Canine Companions for Independence program. He stayed with his breeders for 8 weeks after he was born, after which he was flown to New York as a little puppy and placed with a puppy raiser who then cared for him and trained him for the next 18 months, which, for Ty, was in Haddonfield, New Jersey. After that training period he went to "puppy college" back in New York where he went through an intensive additional 6 months of training -- with the probability of a 1 in 3 chance that he would make the cut to be an official service dog. The puppy raisers are the quiet heroes of this service dog process. They invest so much time and money into the care of these young dogs. They expose them to everything they can, attend workshops and training classes and devote 1 1/2 years of their lives to raising them. The part that amazes me the most is that they invest and give all of that only to selflessly hand over the leash and walk away. I am sure they leave a little piece of their heart with that puppy they return to CCI. Hopefully that hole is filled and overflowing when they return to the graduation in 6 months and see that dog in its handsome blue service vest and once again hold that leash and pass that leash over to a person with disabilities who will have their life forever changed for the better because of that dog they just received. I don't know how they do it. I can barely part with a worn out favorite pair of flip flops after a summer. How do the puppy raisers part with the dog they have just raised for 18 months -- often times raising one puppy after the other? It is a beautiful selfless love and that love shines out of Ty's puppy raiser, Ms. H.
Consequently, when I was looking for a place for Ty to go spend a few days while I left town, I could think of no better place than his puppyhood home. I drove up to Delaware to meet Ms. H at a mall for the hand-off. I was walking through the mall, pushing Bridger with Ty dutifully walking along side him. Ty was all business -- his head slightly down and invisible blinders on, only paying attention to Bridger. I knew Ms. H was just around the corner and as we turned the corner she spoke a few words. Ty, slightly confused at hearing the distantly familiar voice, perked up his head. His eyes got big. Then he saw her and there was no holding him back. I "released" him and let him have at her. It was a love fest to behold. His big nose was taking in every wonderful memory of his past. Watching him burrow into her and actually try to climb in her lap was hilarious. It was as if he was trying to be that puppy once again. We had a brief but lovely visit and each hopped on I-95 in opposite directions to return to our home state. In looking over the involved lists of details for the care of my children while I was gone and making sure I was satisfied that they would be happy, I had absolute certainty that Ty was beyond happy with his care while I was gone, too. Indeed, he was. Text and picture updates sent to me showed a dog reliving every happy place and face of his youth. Even though a year and a half has passed since those happy days, his nose still knows.